Full disclosure here: Due to a number of factors, I was creating all of my projects this month at the last minute. Luckily, after a slow start, this was somewhat easy to do because the kits were so inspiring and I got ideas from everything I touched. While it's not always that effortless to create on a whim--either with an amazing collection or without one--there are a few things you can do when you're in a creative crunch. For one, I just went with my gut and created what I felt comfortable making. I didn't try any fancy new techniques or tools (although, sometimes that actually does help get you out of a rut); I kept my projects fairly simple and stuck to what I know and like to do, and allowed myself some time to get acquainted with the kits, and my projects. That means that I tried not to get stressed when, after 2 hours of sitting at my desk, pouring over all of the kits, I still had no concrete plan for what I was going to make. That kind of expectation puts a lot of pressure on you and only makes things worse, so walk away for a little bit if you have to and come back to it. What ended up happening for me was that each time I walked away, I came back with a clear head and the pieces fell into place. Then there are the times when you're so sure you have a brilliant idea, yet when you sit down to create, it just doesn't work out. That happens to me more times than I care to tell you about! The story behind this particular project is that it's based on the first notion I got way back when I received my March kits, a few weeks ago. I looked at each piece in every kit, got really excited about all of the possibilities, and then happened upon the wood pieces from the LP Themed Add-on. The little rabbits looked just like marshmallow Peeps and I've gone slightly bunny crazy since Nemy was born 2 years ago when I decided little rabbits would be her "thing." 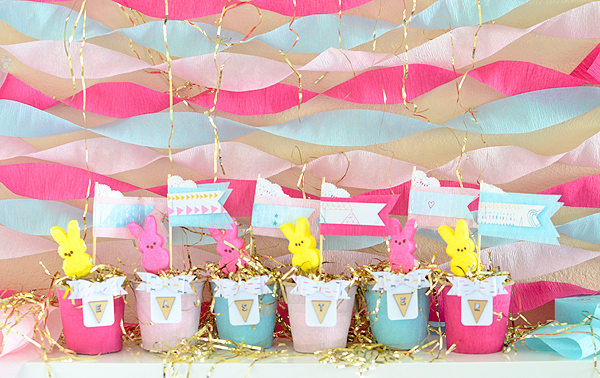 Her birthday is in March so wouldn't adorable Peeps party favors be so cute at her party? Yes! They totally would have been...if I could have made them work. The problem with that is I got distracted by all the unicorns in the kits and that killed it for the poor sweet bunnies. 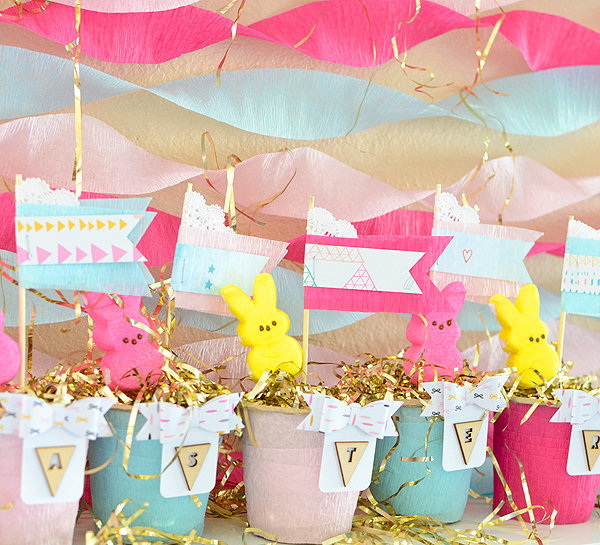 However, I had gone out and bought the Peeps already, had the toothpicks and the bamboo skewers, and the little planting pots that I wanted to use. I had no good ideas on what to do with the unicorns, but I had a semi-formed plan for the rest of the stuff. So my birthday party favors became Easter favors. I kept running into walls as I was trying to bring the concept to fruition, though. I had the plant pots but, left naked, they were too boring (dull brown) for the colorful ideas I had. What to do...I could cover them in paper, but paper's not very forgiving when it comes to tapered containers. I could paint them; that would take awhile and they wouldn't be dry by the time I needed to decorate them. (Even though I got the idea a few weeks ago, I didn't actually get to start this project until the day it was due!) Well, crepe paper is all the rage and I happened to have a few rolls from the last time it was all the rage. 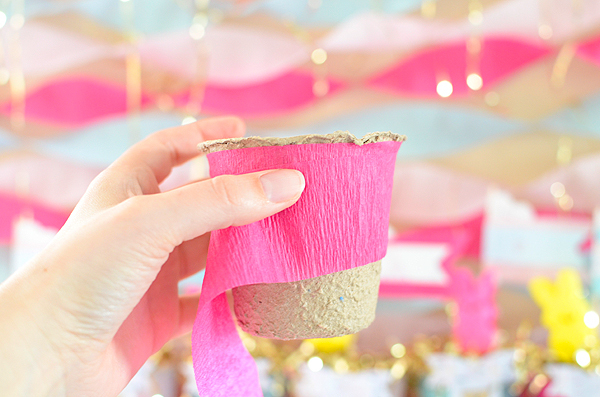 Crepe paper is more malleable and much thinner than patterned paper and wraps around the cups so easily. 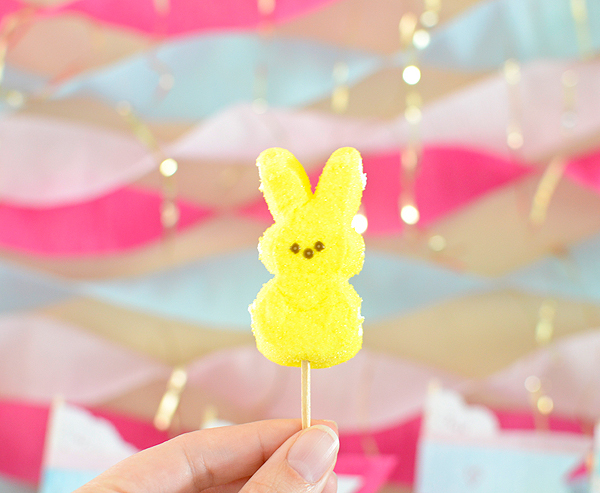 Crepe paper for the win! 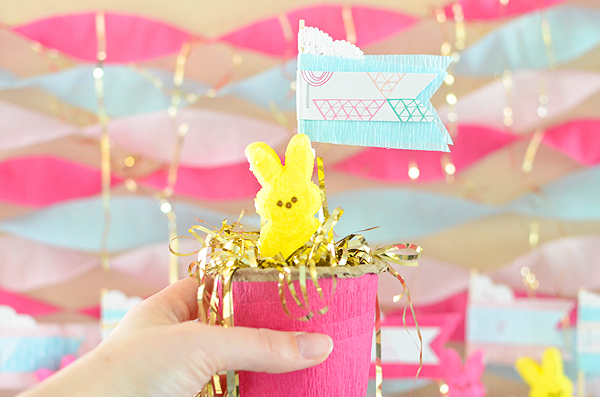 Since this is all about improvising, what do you do when you don't have crepe paper--or little planting pots for that matter? 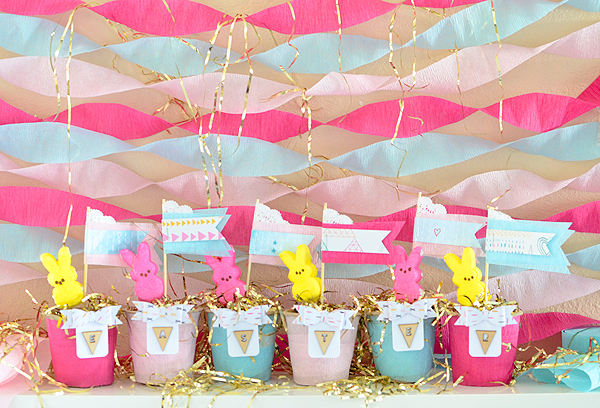 Try using ribbon or twine and, depending on the width, wrap it around a few times. You don't necessarily have to cover the entire cup. 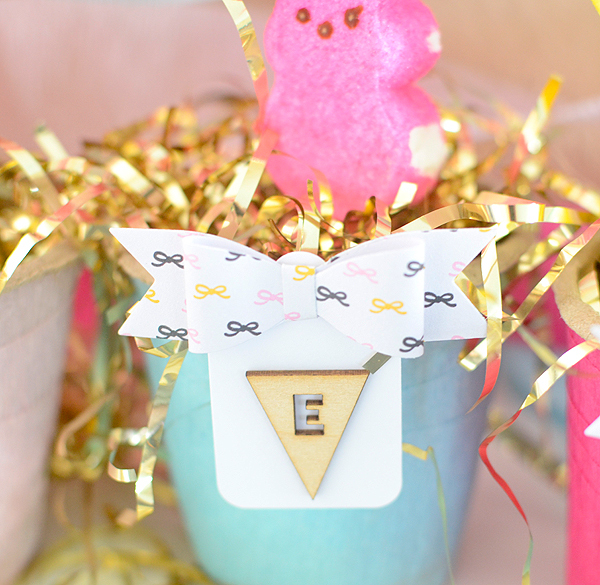 Washi tape, glitter tape, fabric...any of those will work just as well, too. 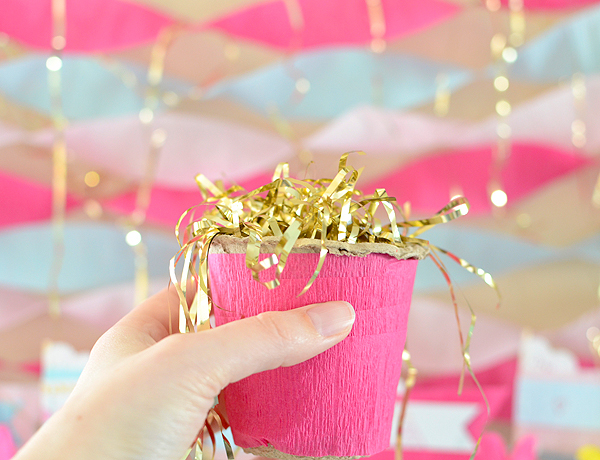 As for the pots, standard paper cups would work--if you have anything fun or festive left over from your last party (or you've already done the shopping for the upcoming one), those would be great and probably wouldn't need the cover! 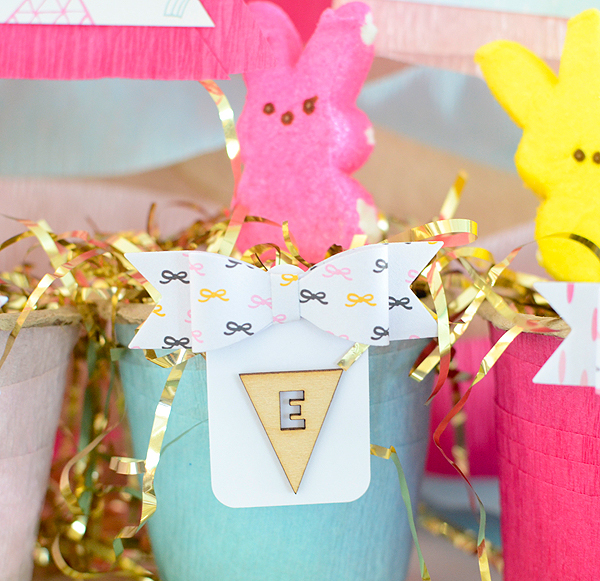 Then I remembered that, well, skewering the Peeps on a toothpick is a great idea, but how are they going to stand up in the cups? These aren't filled with dirt or yummy cake into which I could sink the toothpick. I didn't have any flower foam and had no time for shopping. 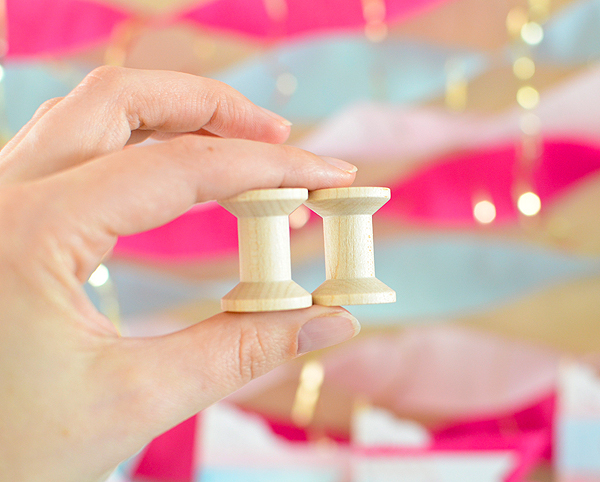 So I looked around my work table, saw some 1 1/8" wood spools and decided those would be perfect. I have a bag of 100 of them in my cabinet so there were plenty to use. I needed 2 of them, stacked on top of each other with a large Glue Dot in between to hold them together. (The pointed ends of the picks will pierce through the Glue Dot and the sticks will slide to the bottom of the cup.) Another Glue Dot on the bottom spool adheres it to the bottom of the plant pot. What's that? 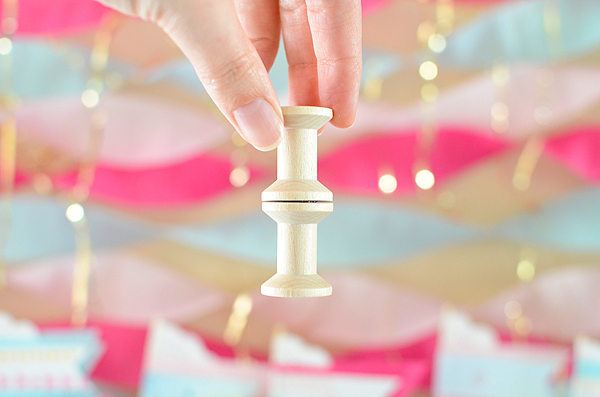 You don't have a bag of 100 wood spools in your drawer? 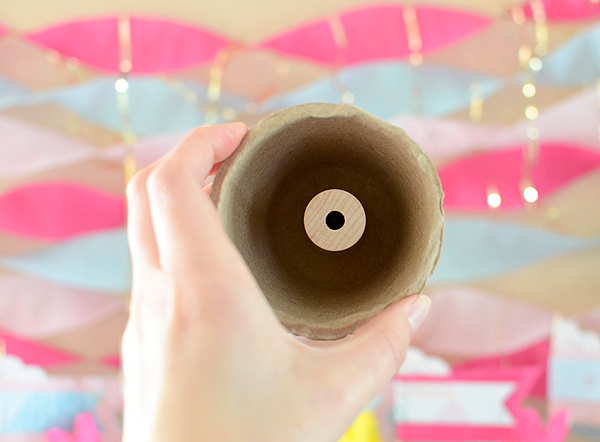 Try any other thread spool you do have, thick styrofoam, or cork. 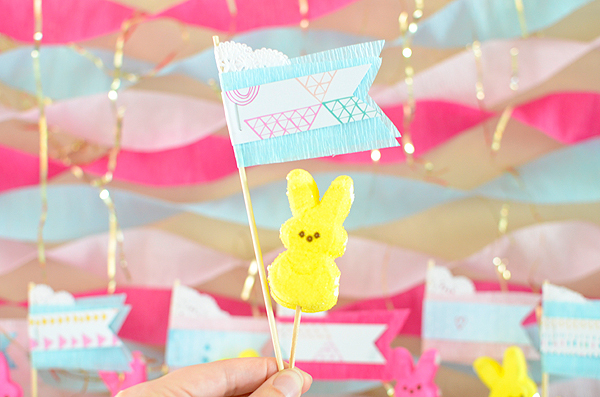 Then it was time for the only part of my plan I had actually had the foresight to think through...the Peep on the toothpick and a paper flag. 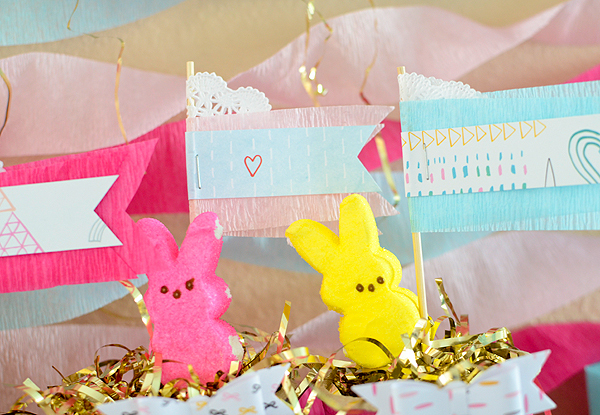 For the flag, a piece of doily, matching crepe paper, and a snippet of patterned paper from the kits; simple, but colorful. Next up, adding some fill to the cups. 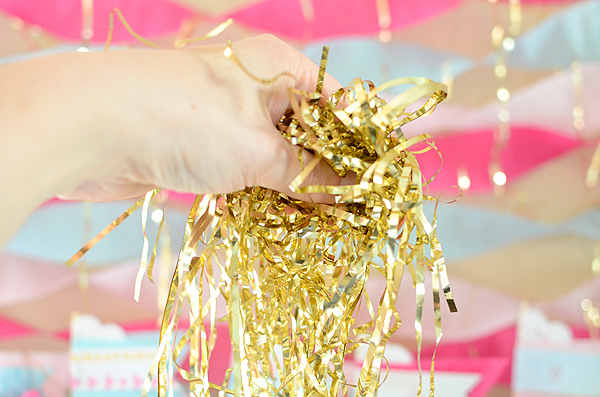 This gold party tinsel is my new favorite craft supply and I've been using it to dress up many of my projects lately. I buy it at the local discount store. 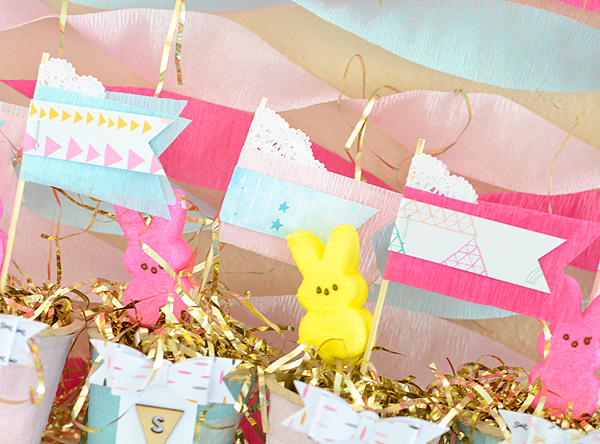 If you can't find any, try Easter grass, shredded paper, or kraft shred, sold in the gift wrap aisle of most big box stores. 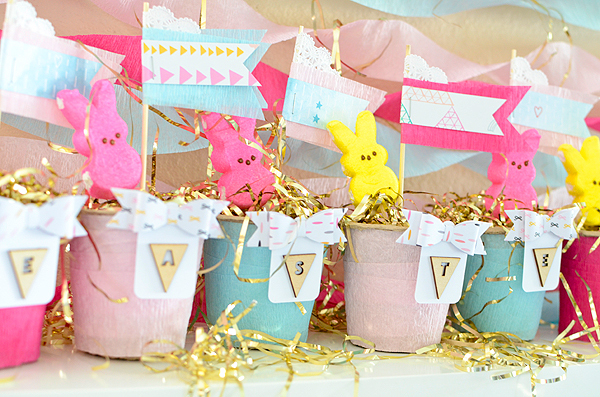 You could also fill these with jelly beans or a similar candy (and that might solve the problem of anchoring your picks, too), though if you are using the plant pots, I recommend lining them with food-safe paper first. Easy, right? And kinda cute, too. The finishing touch were the little tags with the bows, with the wood bunting spelling out Easter. 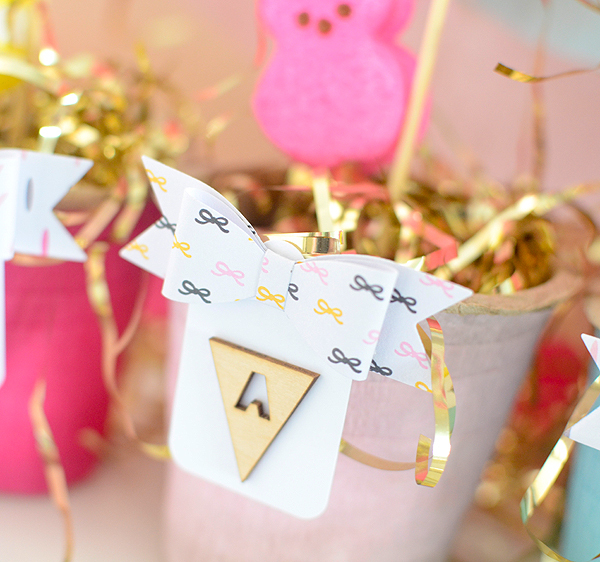 The bunting is from the LP Themed Add-on and you can find the paper for the bows in the 6x6 paper pad from the Bits & Pieces kit. This was not my original plan...you'll not see those adorable wood bunnies anywhere in this post. But things like this happen to me all. the. time. It's ok to just go with it and change your plans. Don't hold onto your original idea so tightly that you lose sight of another one. And don't panic if you have the perfect idea but lack the perfect supplies to go with them. It's all about mindset; instead of thinking about what you DON'T have, think about what you DO have. You'll think of something; trust me!